Improvised music is one of the few fields where something like this can happen: having a new band with people we never imagined together, and better still considering that the attempted combination results in something as astonishing as this studio recording. 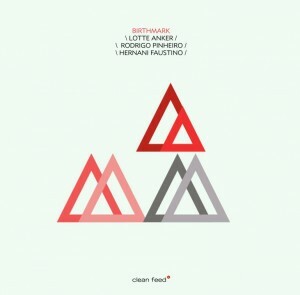 While listening to “Birthmark”, the first, immediate, impression we have is that the association of Lotte Anker with pianist Rodrigo Pinheiro and double bassist Hernani Faustino makes all the sense. More: that it was written in the sky. If there was a common characteristic inviting to turn a reality this reunion of the Danish superb saxophonist with the two Portuguese members of the much acclaimed RED trio, it gets brilliantly evident in the music played here. Let’s call it “intensity”. All the three of them are intense musicians. And take notice: intensity, here, doesn’t mean they function as an elephant in a porcelain store. Sometimes it seems so, indeed, but there’s also intensity when they restrain themselves, choosing to be subtle and meticulous in their static and very spatial group improvisations. There’s intensity even when Anker, Pinheiro and Faustino lower the amount of notes produced and are more concerned with the maintenance of fluid atmospheres. Only density gives nuance to the shared power of the trio, going from the most transparent textures to the opaque mixing of several layers of sound, with all the dynamics in between. If you liked Anker’s flights with Craig Taborn and Gerald Cleaver, you’re certainly going to discover in this CD other good motives to keep her as a favorite horn player, and if the poetic abstractions of RED trio with John Butcher and Nate Wooley made you happy, here is more material coming from the same mindset and the same sensibility to the here-and-now. Enjoy.